This is a major pipeline for the country. Reports from Nigeria have it that an unknown militant group in the Niger Delta region has reportedly blown up the Abura oil pipeline, a major oil trunk-line operated by the Nigerian Petroleum Development Company around Osieta Avenue near Otu-Jeremi in Ughelli South Local Government Area of Delta State. It was gathered that the trunk-line was reportedly bombed on Sunday morning about 6:40am by the militants causing serious fire outbreak in the area. 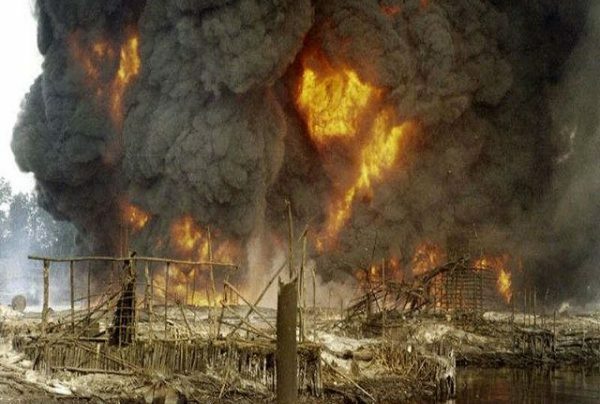 The incident occurred a kilometre near the West African biggest Otorogu Gas Plant, hosted by Otu-Jeremi, Iwhrekan and Otor-Udu communities across Ughelli South and Udu council areas of the state. A Local residents confirmed the incident. A source said it was the swift intervention of fire service men from the Otorogu Gas Plant that stopped the fire from spreading to residential buildings. There was no casualty in the fire incident that lasted for over five before it was put off, another source added. The Abura oil pipeline is one the major trunk-lines that supplies crude to the Otu-Jeremi Flow Station and the Otorogu Gas Plant. The Chairman of Ughelli South Local Government Area, Mr Paul Etaga, who had earlier visited the scene of the attack along with Lt. Col. U Abdusalam, Commander, 222 Battalion, Agbarha-Otor, Ughelli North council, confirmed the incident.